Another Starcrossed CX is over. This year yet again Seattle failed to live up to its reputation as Rain City as the weather served up another velodrome dustbowl, but Starcrossed is just about the most fun race on the calendar. First of all, there’s a beer garden and a real party atmosphere alongside the taped off race course. Secondly, the races start later in the day and then run well into the evening, if you’re not really a morning person. Duke it out in the lower divisions and then stay to watch top-ranked US professionals (and the occasional Euro star) slug it out. Thirdly they have a beer garden. 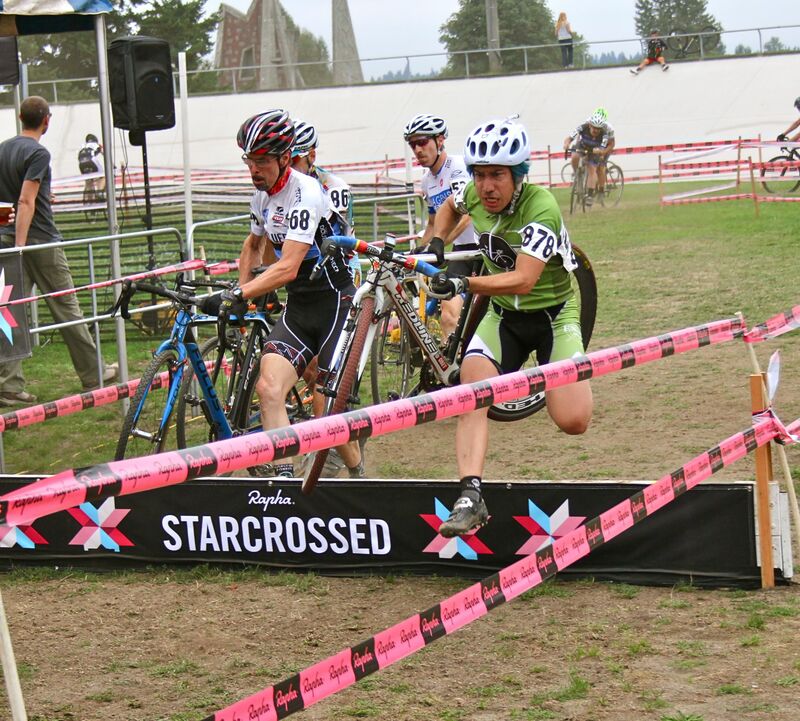 Starcrossed is the biggest cyclocross race for Washington state’s season, which I guess is a little odd since it comes so early, just the second official event in the area. On the other hand, it’s a great way to convince your family or friends that there is merit to your spending weekends riding on and running with a bike through filth. Drag them to Starcrossed for some of the best spectator values in cycling, and they might be game to hang out with you at those morning races later in the season when the weather is invariably foul. And if you haven’t done a ‘cross race yet, checking out Starcrossed is likely to start those gears turning in your head and have you googling “cx bikes” on Monday morning while you pretend to work. I race Category 4 Open, which could be interpreted to mean that I am too slow or train too little to advance to faster categories while simultaneously too stubborn to join the masters age divisions. Cyclocross events roll off several categories at the same start time, separated into different waves at intervals of a minute or two. Within short order after the start the entire course is a long line of riders with gritty faces, and it’s a little confusing to the spectators who cannot differentiate the separate categories by their race number (hell, it’s confusing to me!). All I know is that there is always someone a little ahead of me that I want to pass. And since this year I drew the absolute last start position on the grid, in the last wave of riders in the 3PM start time…..everyone was ahead of me. With nearly 300 riders between me and the finish line, I knew I would need to be aggressive from early on to achieve a respectable placing. My woeful endurance at high output makes me loathe to reach too deep in my pocket for the first lap, but I didn’t really have a choice. At the whistle, I threw down to pass 20-30 riders before the first turn. 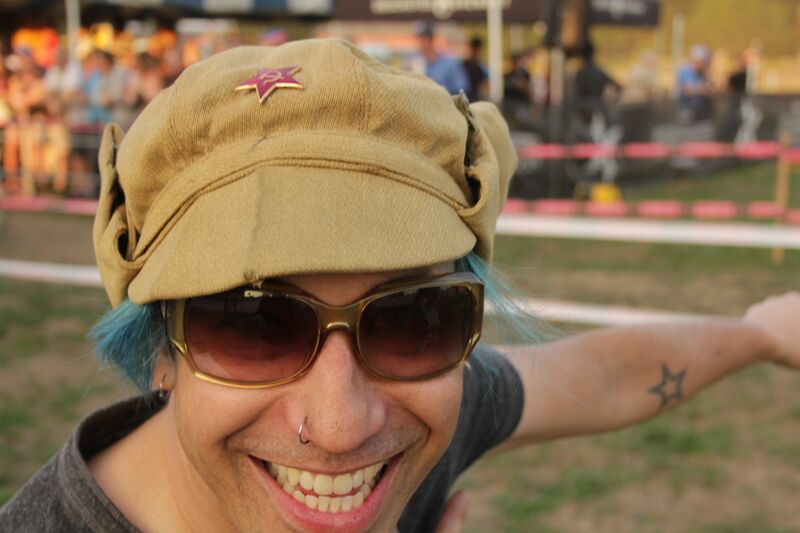 This is my fourth or fifth Starcrossed. Each year except for one has been held at Marymoor Park, at the north end of Lake Sammamish, with a course that snakes around and into the velodrome. The course at Marymoor is fairly consistent in layout from year to year; the only change from last year worth mentioning is that they used a short wooden stair rather than logs at the run-up. Had the weather been wet, it would have been more challenging than a series of logs. While several logs in a row dictate your stride length and count, wooden stairs allow you to choose where you step but you cannot hurdle the entire length of steps. If it had been raining, those steps would have been more dangerous because riders must put foot upon slippery wood, and the potential is high in the melee of the first few laps of a race for individual racers to fall and bottleneck the field. Cyclocross is the one discipline of cycling that both officials and organizers allow a truly wide array of equipment to enter, at least in the lower divisions. Just about the only rules that USAC officials enforce are those prohibiting forward-facing handlebar extensions and fixed gears. However, good course design will either be too fast or have too many run-ups to favour a heavy mountain bike; likewise it would be too bumpy or muddy to allow a skinny tyre road bike to excel. Most of the CX courses near Seattle feature a labyrinth on a grassy section that lengthens the lap distance within a small overall geographic space, but Starcrossed is relatively straight forward. Though there is a very abbreviated maze within the velodrome infield, there are only a few hairpin turns, and those come at the ends of longer straightaways. Other than 2-3 very short inclines ideally negotiated with a handful of torque-laden pedal strokes, the course is largely devoid of anything requiring a low gear. There are several grassy, off-camber sections around the exterior of the velodrome, the character of which changes dramatically depending on the weather; wet grass will shrug your tyres out from beneath you with indifference. But though the Pac NW gloom had been knocking on autumn’s door, it hadn’t yet stepped through to piss all over us. And a dry Starcrossed has one overwhelming theme: dust. Early fall in Seattle can be grey but the air is typically remarkable in its clean crispness, devoid of the auto exhaust of other cities or the early season’s pollen. But by mid-afternoon of race day, nearly a thousand angry tyres ripping into the dry grassy fields and dirt trails has whipped a fine silt haze airborne. The dust cloud worsens throughout the day. It gets in your eyes, your nose, your lungs. During the race, the visual aspect is what bothers me most. In the second half of the race I couldn’t see the ruts in my path, and slamming blindly across rough surfaces saps your momentum. The next day when my nasal passages are still expelling dirt-stained mucus is what weirds me out. Cyclocross participation gives you ample opportunity to learn your relative strengths and weaknesses as a rider, and a smart rider will quickly put those lessons to use. I myself have somewhat poor high-intensity endurance but I can read my immediate surroundings well to pace myself effectively. Why sprint up to a hairpin turn when it’s already clogged with riders? Better to conserve for a moment so to grab a better exit line with a sharp acceleration. The rider ahead eased off well ahead of the last turn? I’ll brake hard and late in the turn to clear the apex first. This works because my acceleration is better than many Cat 4s and I have good technical skills. Approaching a turn, I have already plotted out several lines for different tactical situations that I rank based on risk vs potential gains. The one piece of advice I want to emphasize for Starcrossed is this: stay low on the velodrome banking. Someone always tries diving off the banking into the grass chicane before the barriers, but even in the dry getting traction on the concrete banking with CX tyres is just looking for love in all the wrong places. You may feel like a match sprint hero going high on the track’s blue line but then your front wheel washes out when you try to sharpen your turn radius at the end…..and you go down on the hard stuff. A skilled rider who stays well below the red sprinters’ line might be able to make a tactical pass in a slow, crowded situation, but the banking does not have the fastest line otherwise and is too risky to boot. As it was, this was far from the only place to crash, as lots of riders found their misfortune awaiting them in the runups and chicanes. I saw a surprising number of utterly disemboweled wheels in the pits. To keep clear of the trouble it is good to bring some race savvy because there is often not enough luck to go around. For me, Starcrossed is a deceptively slow course. Though there are several long straightaways, they’re too long for me to burn at full output without tiring and too open for any meaningful gains from short accelerations. A strong, road-oriented rider can really make some gains in those places, but the long off-camber sections favour those with better technical skills. There are plenty of passing opportunities outside the velodrome, but the interior is a minefield of ruts devoid of a smooth line. Sprinting across the bumps of the finish straight is outright punishing. The double barriers alongside the beer garden lose more of their menace each year as I have grown more confident in my dismount/remount technique, but the silly daydreams of bunnyhopping the regulation height obstacles leave my head during the warmup lap and probably won’t reappear until well after the season ends. Given my fitness level and start position, I can say that I had a successful Starcrossed. I finished 23rd in my category after being dead last on the grid, which shows some spirit and aggression. I think a top-15 finish might have been real possibility with a better start position, but I just don’t have the endurance at the moment crack the top-10. I really appreciate the few times a fellow racer called me out for slacking on the straightaway; it gave me just a little more motivation to keep my speed up. Entering the finish straight for the last time, there was no one within striking distance, but I launched a kamikaze sprint anyways…just on principle. I made it another 20 meters before I dumped the bike on the other side of the course tape and sprawled out alongside in the grass. What followed was the racers’ ritual of clumsy parking lot costume changes and hearty “Yo, how’d your race go?” exchanges among fellow racers, dusty faces like smiling raccoon masks. I spent the rest of the afternoon and early evening walking the course to cheer on friends in other categories and drinking too much, as per my traditions. My friends don’t let me near podium girls anymore since that 2004 incident though. 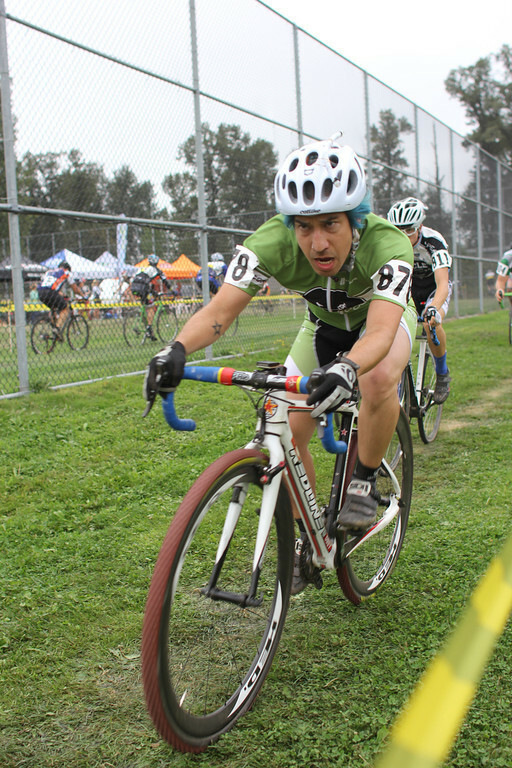 There are a few more cyclocross races this season, particularly at Magnuson Park and the MFG-series closer at Woodland Park, that will have comparable sporting and partying potential. On a bike or on foot, by hook or by crook, you should join the scene for some fun.